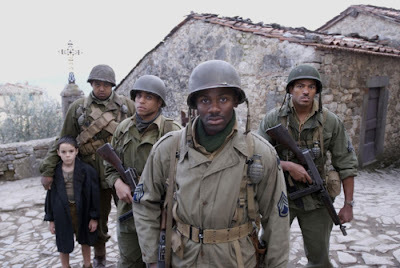 Spike Lee's new movie, "Miracle at St. Anna," will give black soldiers in World War II the starring roles that are missing in other Hollywood films about that epic conflict. History books and documentary films seem to have missed the service of these black heroes too. AAEA also still experiences this type of blackout even to this day. The movie is based on James McBride's 2002 novel of the same name and chronicles the story of Joseph Stephenson, who fought in the all black 92nd Infantry Division. There were no blacks in "Saving Private Ryan"--[maybe Vin Diesel, but he seems ambivalent], "Flags of Our Fathers," "Letters From Iwo Jima," "The Thin Red Line," "From Here to Eternity," and many other films. A few other films have featured blacks in integrated casts. And of course, now you have a white man, Robert Downey, Jr., playing a black man in the satire on Hollywood war movies, "Tropic Thunder." Of course, they also have other blacks in this funny film. Unfortunately, when our society thinks World War II, they do not picture any blacks participating. The reality is that many blacks served in that war. They also dealt with the racism waiting for them when they got back to America. Spike Lee recently goosed Clint Eastwood for not including blacks in his two war films. Needlessly to say, Clint fired back. Clint has produced films starring blacks, including "The Charlie Parker Story" starring Forest Whitaker. Many in America continue with the insanity of purposefully excluding blacks from history making events and activities. This speaks to the continued need for black operated and owned institutions, because if not for Spike Lee, it appears that no white person would tell this story. But with the insanity that permeates American society, even when a white person does step forward, as Steven Spielberg did with "The Color Purple," blacks complain about the white director. The same thing happened with the movie "Malcolm X," where the white director was eventually replaced by Spike Lee. Racism is a whacky confounding variable in normal activities and an incredible inefficiency in the American system.